Judd Spicer At a golf course in Minnesota, players actually play during the winter. Yes, they are crazy. I woke to sunny skies, 10-degree weather and 18 mph winds. Yep, we Minnesotans love a challenge. The Majestic Oaks Golf Club in suburban Minneapolis is a frozen tundra that turns the gentleman's game into a clumsy dance with a single club, tennis ball and eight-inch cup. All for $5. "People don't bat an eye to go outside and cross-country ski, or sled, or snow-shoe, or go ice fishing," Majestic general manager Dan Jacott said. "Why not golf?" 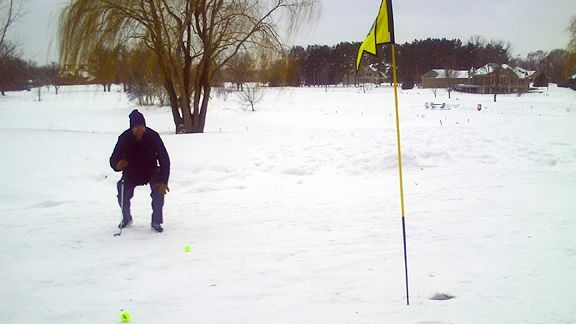 Majestic is believed to the only club in Minnesota that offers snow golf throughout the season. On a January morning, Jacott, course superintendent Dan Hanson, "Lucky" and I set off to conquer the 9-hole, par-36 course. Carved in a horseshoe over part of four holes on Majestic's Executive Course, the track is one of three available. In the warmer months, Majestic offers three course options, as well. During the 45-minute round, Lucky and I learn why Jacott co-owns the course record of 31. We struggle to "pick" the tennis ball from the powder and ice with a 5-iron. Jacott eagles the 65-yard first hole. Trading an interlocking grip for a baseball grip helps with sweeping the ball off the snow and ice. As an icy wind blows across the middle holes, Jacott tries to convince us that snow golf is similar to its more civilized relative by telling us that the grounds are organically subject to the elements. "It kind of an ongoing process as to how the course looks," he said. The course is groomed using the same tools used in bunkers. And the layout differ depending on whether there is fresh powder or a layer of ice. There's an element of insanity to the game. But on, say, a 25-degree day -- without a face-piercing wind -- it's understandable why Majestic has found success (325 rounds the week after Christmas). Players develop a hunger to improve and refine. So claims to numb player that fired a frosty 46 while Jacott came within a shot of his record mark with a 32. My playing partners shot 43 and 38. "Pretty hole," Lucky remarked as we headed in on No. 9, an 80-yard, dogleg right with a bowled green.